Want to enhance your look without wearing a wig? 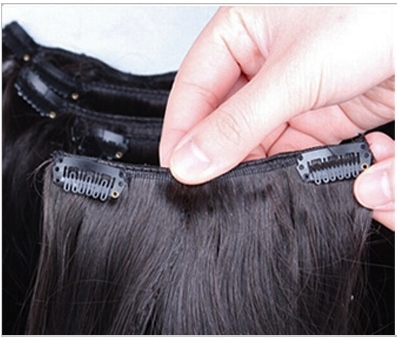 Then the hair extensions clip could be just what you’re looking for. With the click of a clip you’ve immediately transformed your look. Go from office mode to sassy chic mode in a matter of minutes. The great thing about clip on hair extensions is that you can buy them in virtually any colour and density. So whether it’s to add a splash of colour to your hair or simply give your hair a fuller look with additional extensions that match your own hair then clip in hair extensions are the way to go. Clip on hair extensions are like ordinary hair weaving wefts with the addition of a small clip at the top. 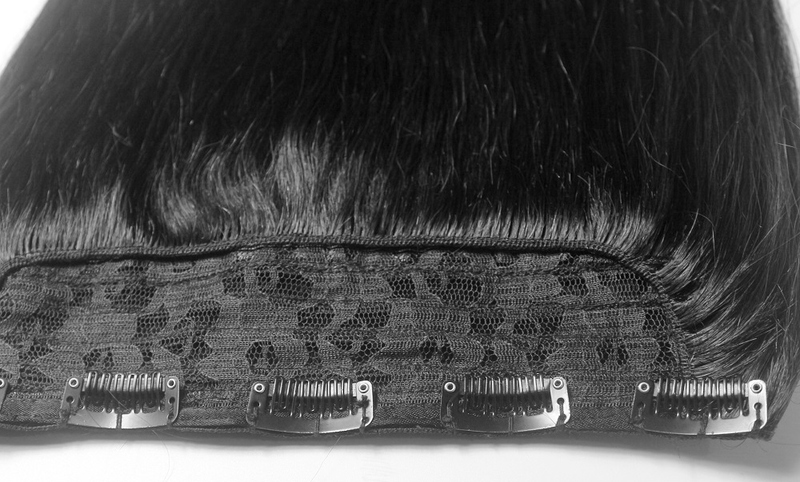 Each weft can be anything from an inch to six inches in length with several clips to hold the hair in place. Due to the nature of these extensions, you don’t need to go to a salon to attach them; you can do them by yourself. If you’re unsure, follow the easy three step guide to attaching clip in hair extensions. 3 - Repeat until you achieve the desired look. Handy Hair Hint: Style your hair and the clip in extensions before attaching the extensions. How Long Can You Leave Them In? "Hmm why the odd phrase?" We hear you ask. Well it’s because you might choose to wear your extensions clip on a night out, so if you stroll in at 4 AM and want to go to bed, then that’s the time to take out the hair extensions clip! In addition to the different sized clips, the larger clips are also available in different densities. You could choose to buy a single 9” piece that weighs about 35g. Clip in hair extensions are also available in multi width sets which usually start at seven piece sets and can increase to 12 piece sets and come in varying densities (weights). The weft size ranges in width from approximately (1 inch) 2.5cm for the temples to 23cm (9 inches) for the back of the head. Human Hair or Synthetic Hair Extensions? Ah, the perennial question… human or synthetic. We can only give you the information; you have to decide what suits your needs. There's a wider variety of colours for synthetic clip in extensions so that may sway your decision. Human hair has the benefits of being treated like, well, human hair! You can curl it, straighten it, blow dry it; it’s up to you. There are the same textures for both types of hair and you can check out the guides about straight hair textures for clip-in hair extensions as well as curly clip-in hair extensions and of course, wavy clip hair extensions. Synthetic hair doesn’t like heat unless it's labelled as heat resistant synthetic hair. It's not all bad news though, you can still use rollers and hairsprays and mousses to achieve your desired look. Handy Hair Hint: If the idea of glues, cornrows or pre tipped extensions requiring bonding leave you feeling bewildered then a synthetic or human hair extensions clip could be just the thing for you. However, if you still have more questions, then have a look at frequently asked questions section on clip on hair extensions the before you part with your hard earned cash! Speaking of parting with cash, if you've never bought clip in hair extensions before, it might be an idea to find out whether you can return clip in hair extensions if you have a change of heart when they arrive through your door. In addition there are some other points to consider before buying clip-on hair extensions. There's more information in the Hair Extensions Q&A section as well as the navigation menu, or you can keep up with all the latest info on clip-hair extensions, wigs, and weaves by joining our blog; it's easy to do and doesn't require an email - hooray!